When I was in Nee Soon Camp undergoing 3-months BMT (basic military training), i met my first buddy who is a NJC grad. I can't remebr his name but he has a fit and big sized body. Later I found out he is "excused sweat" by the military medical officer in Nee Soon Camp or he has a valid medical excuse from one of the hospital. Guess what I have to do for him? Not only I have to do what the picture below shows, I have to carry his rifle , piggy-back him back to medical center during one of the exercise.. really ali ba ba! When he see this post, he better thank me man. Buddy, where thou thee ? IMHO, present days GenY Soldiers are indeed enjoy better life and higher salary pay too (at least twice as much as compared to 1997-2000). Perhaps there's also no urgent need to fight for survival as far as combat activities are concerned even though there are "threats" surrounding the country , threats are everywhere in the world. The present generation of citizens do not have the thoughts of what it means to survival under poor, disasters and war time conditions as they do not have to undergo such ordeals. As such, they have not develop a sense of urgency and tends to enjoy the fruitages of what the older generation have accumualted (or suffered). Unless a disaster or country-wide tragedy strikes (hope not), we'l probably see more parents/ maids of the present gen carry things for them, which is always right as they are precious apple in their eyes. Why let them suffer when they have to book in to be "the-kan", ie go thru tough army trg in bmt? ﻿ "A photograph being circulated online has sparked a heated debate about whether Gen Y soldiers are too pampered. 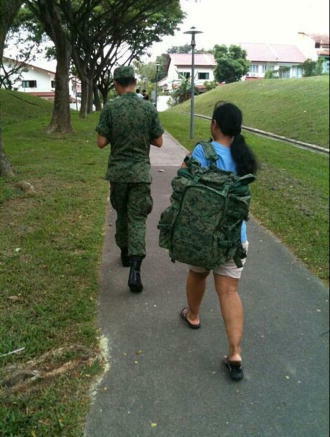 In it, a young man, dressed head-to-toe in army fatigues, is captured with a woman carrying what is presumably his backpack. The photo was posted on The Straits Times' online portal Stomp at about noon on Sunday.Responding to a Straits Times query, a Ministry of Defence spokesman said 'the SAF takes a serious view of the conduct of its servicemen in public'. She added that the SAF will investigate and take appropriate action. The photo had attracted more than 180 comments on Stomp as of press time. A posting on Stomp typically attracts about 50 comments.It was soon posted on social networking site Facebook and online forums like hardwarezone.com.sg, which attracted more than 300 comments on it. It is not known where or who the image originated from. Its authenticity also could not be verified. "